My last post on Why Software will Always be Hard got me thinking about the implications for the software team that wants to create value (i.e., be worth more than they cost). If the bar is constantly being raised on what is considered commodity, then the software team creating value, must continue to get better in order to continue to deliver more next year than they did this year. In the graph above, I’ve depicted the drive toward higher and higher expectations as the blue line. The green line represents the delivery level of the high-performing team. The space between the two lines represents the value created by that team. 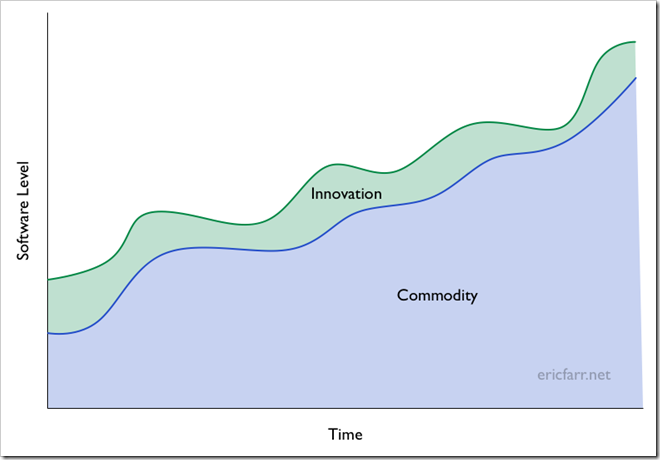 In order to continue to deliver value, it must continue to innovate to deliver more for less. While the commodity line drives steadily upward, the innovation line sometimes plateaus and may even drop prior to new increases. Innovation always brings risk and sometimes they will reduce your output before improving it. This is why even the high-performing team must continue to look for and expect improvements in its processed and technologies.